Scott Davidson joined Langley Properties Company as its Director of Operations in March 2012. His responsibility is to oversee the operations of the company in all areas including leasing, marketing and property management. The current portfolio consists of office, retail, and industrial properties in Kentucky and North Carolina. 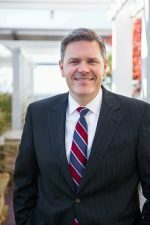 Prior to Joining Langley Properties, Scott served as a regional leasing and property management manager with TIC Properties Management LLC. He gained his early real estate experience as a Property Director with the publicly traded IPC US REIT. Scott graduated from Eastern Kentucky University with a Bachelor of Science degree. He holds a Kentucky Real Estate Sales License and is a member of the National Association of Realtors, the Kentucky Association of Realtors, Commercial Property Association of Lexington (CPAL) and is active in the Institute of Real Estate Management (IREM) in Lexington where he is IREM’s Chapter Treasurer. Scott also serves as a board member of the Downtown Lexington Management District (DLMD). Scott enjoys golfing and spending time with his wife Audra and sons Grant and Chandler.